Mini has joined a growing list of automakers that have released high-performance concepts for “Gran Turismo 6” on the PlayStation 3 game system. 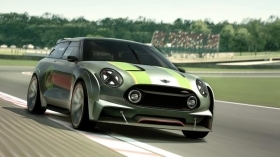 The Mini Clubman Vision Gran Turismo was released today. Its wide stance allows it to handle like a go-kart. After downloading an update, gamers can add the car to their virtual garages by completing a lap in a new seasonal event, which is available for a limited time. The Clubman “weighs” 2,315 pounds and generates 389 hp. It has a top speed of 180 mph. Noting that a Mini wouldn’t be a Mini without customization options, the automaker said the Clubman will be available in five color variants for gamers to choose from. Other design features include adjustable carbon diffusers in the front and rear, along with large vents behind the rear wheel arches to regulate airflow for cooling the engine and brakes. To enhance aerodynamics, there is a split rear spoiler and a fully enclosed underbody. The Vision Gran Turismo initiative, which calls for automakers to dream up concepts for the game, came about to mark the 15th anniversary of the gaming franchise. Car companies now see the gaming world as a key market that builds brand affinity among the next generation of buyers. Design teams from Infiniti, Volkswagen, Mazda, Aston Martin and others have introduced concepts. Mercedes-Benz was the first to do so. This is the BMW Group’s second collaboration with the game.